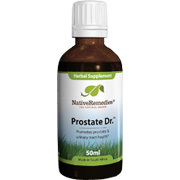 Addresses and treats major symptoms of prostate problems, such as Benign Prostatic Hyperplasia (BPH), prostatitis (infection) and enlarged glands. Brings fast relief. Regular use prevents recurrent episodes. 15 drops in a little water three times per day. As a preventative it is recommended that all men over 50 should take 10-15 drops in a little water two to three times daily. Epilobium parviflorum, Sabal serrulata (Saw Palmetto), Hypoxis rooperi (extract of African Potato). How long does a bottle last: One bottle will last 25-30 days. Prostate Dr. is shipped in a discrete, unmarked package. Orders are processed immediately and usually take about 3 to 5 working days to be received. We do ask that you try it for 2 to 3 weeks to feel the full effects. Any information received is used only for order processing and shipping purposes. Your information, such as e-mail address, will never be disclosed to a third party.